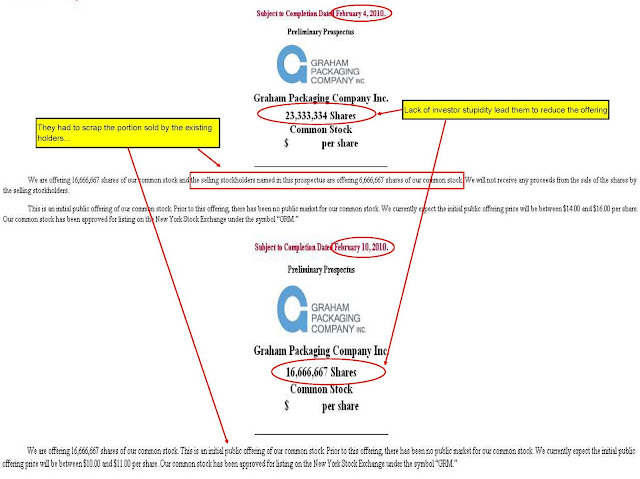 After multiple delays, Graham Packaging (GRM) priced last night at $10 per share. I believe it's trading at that level right now. In a period of SIX DAYS, the offering was sliced from 23.3million shares to 16.7million shares, the main difference being that Blackstone and the Graham family have scratched selling their shares in the deal. The company itself will still sell the planned 16.7million shares, but at $10 per share instead of $15 - a substantial $83million drop in proceeds. So, on to the positives. One thing you can count on in a hugely leveraged private equity-owned company is a focus on margins, and that focus has been marvelous. 2008 gross margin of 14.7% was a 3% increase over 2006 levels. The first 9months of 2009 saw gross margin increase further to 18%, despite a 13% drop in sales. Adjusted EBITDA could come in at about $460-470million this year, on sales that will be still depressed due to economic conditions. As should be expected, every last bit of productivity is being squeezed here. The problem, of course, is what has been done to Graham's beautiful cash flow stream. It's been saddled with enormous debt. One thing I do like is that management will be very incented to perform well for stockholders, as they will own about 755,000 shares after the offering, and that excludes incentives tied to stock options. A comparison of Graham to other packaging and container companies is really all you need to look at to see why the deal price had to be reduced. The MOST important number in there, for me at least, is how easily they covered their interest payments. For the 9months ended September 2009, Graham's EBITDA was 2.95times its interest for the period, compared to about 10times for the group average below. That is why investors laughed at this deal at higher prices. At the current $10 per share, the company is actually not too expensive. it works out to a market value of $725million, depending on your calculation of shares outstanding. 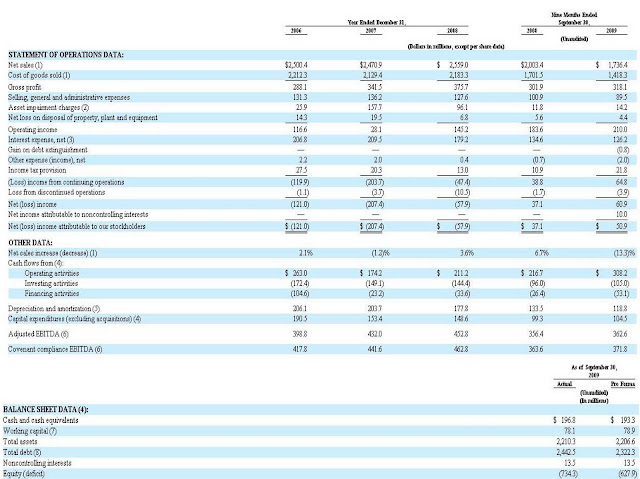 If they hit their 2009 target of $120million in Free Cash Flow (outlined below in management compensation incentives), that's a Free Cash Flow Yield of 16.5%. Not terrible, if you can get over the debt load. What's more, the current implied market value excluding debt is just 1.6times this year's expected EBITDA, versus 3.6 for the peer group above. That discount is due to Graham's higher leverage, but might be TOO much of a discount.